Relax & drink a . We convert your web app or website into native iOS & Android apps. No coding required. Fast delivery. Full support. The #1 way to convert websites into apps. Just enter the URL, upload the icon & choose your settings. We will do the rest and you will receive your iOS & Android apps within 24 hours. Optimized for performance & experience. 100% quality & support. App Store approval guarantee included. Taxes included. Easter Sale is valid until 30 Apr 19. One-time fee & all-inclusive. Full refund if Apple rejects your app. Your app will be ready within 24 hours. Thanks, guys, this was fast! We finished our app within the deadline thanks to your great service and support. We stumbled across so many compiling bugs while trying to set up our own WebView app. Thanks for this great alternative! We saved about two days of annoying work thanks to your service! I would recommend it to anyone, big thanks! Why you will love this service. WebView never looked so great. The stage is yours. 100% space for your website/web app. Wrapped in your native app. We will wrap your URL (e.g. https://www.google.com) or your local HTML folder in a fullscreen native app. No browser address bar, no bookmarking buttons. Just your content at full size. Your user is offline? No problem. Your app will look always great. Even if your user is offline. Don't confuse your user with "Page cannot be accessed" warnings. Show them a great offline screen instead which includes a "Try again" button to make sure they are online in your app right at the moment when they reconnect to the internet. Let's enrich your web app usability feeling by native components. 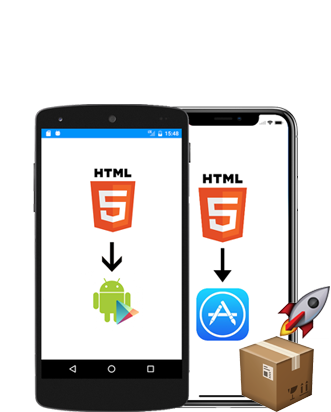 Upgrade your user experience with native iOS/Android elements like dialog boxes and URL Handling for external URLs. Your users will love it. Dialog boxes: "Thanks for downloading" & "Rate this app?" Fast ist great. Very fast is better. Nobody likes slow or crashing apps. Your users will love the performance of your app. Monetize your app with ads and send push notifications. Native experience combined with your web app content. Easter Sale is valid until 30 Apr 19. We are here to support you. Promised.